Injectable therapy using bulking agents composed of synthetic materials, bovine collagen, or autologous substances augment the urethral wall and increase urethral resistance to urinary flow. More recently, investigations of stem cell injections have shown promise for use. The injection of bulking agents to treat a dysfunctional urethra is a minimally invasive method of correcting intrinsic sphincteric deficiency that results in stress urinary incontinence but is being performed less frequently in current practice. Go to Urinary Incontinence and Surgical Treatment of Urinary Incontinence for complete information on these topics. Injectable agents have been used to manage stress urinary incontinence for more than a decade, but their application has been limited by placement, durability, antigenicity, and other compatibility issues. The lack of a single, reproducible response from one agent has led to the development and application of several agents that provide reasonable efficacy with minimal associated morbidity. The continuous development of techniques and materials provides the basis for newer bulking agents. Likewise, recent research has shown promise in the use of stem cells in periurethral injections. Urethral bulking procedures are designed to treat stress urinary incontinence due to intrinsic sphincter deficiency by artificially inflating the submucosal tissues of the bladder neck and urethra. These procedures involve injecting synthetic and autologous fillers into the wall of the urethra to aid in coaptation of the mucosa. Bulking the bladder neck with particulate matter effectively closes the lumen of the urethra by improving urethral coaptation and restores the mucosal seal mechanism of continence. However, issues with migration, leakage, and resorption of injected agents challenge therapeutic durability. Periurethral injection therapy for incontinence. Figure A shows the needle advanced into the submucosa of the bladder neck. 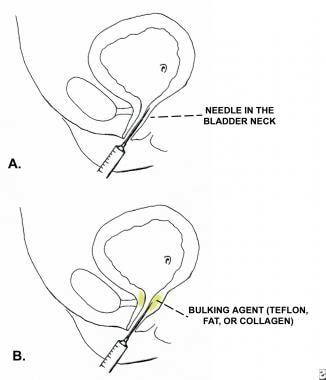 Figure B shows the bulking agent being injected into the submucosa of the bladder neck and proximal urethra. Periurethral injection therapy for incontinence. This photograph shows lead pipe urethra associated with intrinsic sphincter deficiency (ISD). Note the bladder neck is wide open at rest before collagen injection. Periurethral injection therapy for incontinence. 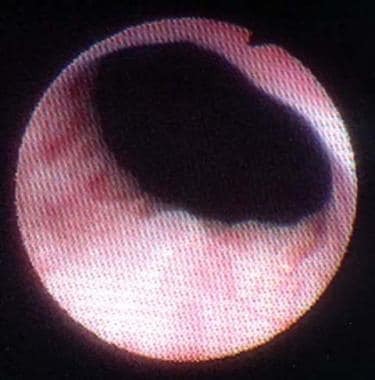 This photograph shows lead pipe urethra associated with intrinsic sphincter deficiency (ISD) after injection with periurethral collagen. Note the bladder neck is closed at rest. Urethral bulking agents reported in the literature include autologous fat, glutaraldehyde cross-linked bovine collagen, calcium hydroxylapatite, pyrolytic carbon-coated beads, polydimethylsiloxane, ethylene vinyl alcohol copolymer, dextranomer hyaluronic acid, and polytetrafluoroethylene. [6, 3] Because of the risk of migration, polytetrafluoroethylene is not approved by the United States Food and Drug Administration (FDA) for treatment of female stress urinary incontinence. Likewise, dextranomer hyaluronic acid has since been removed from the market because of injection site complications. Recent research has focused on the use of stem cells for stress urinary incontinence treatment. To date, autologous cells derived from either muscle or adipose tissue of the patient have been studied. Such stem-cell therapies for urinary incontinence may have the ability to regenerate a damaged or weakened rhabdosphincter in addition to providing a bulking effect after injection. Because their effect is improved sphincter function rather than coaptation from a bulking effect, they are not discussed further in this article. Social indications for surgical intervention include any stress urinary incontinence that interferes with quality of life. Pathologic indications for correcting intrinsic sphincter deficiency and stress urinary incontinence include primary urethral dysfunction, failed previous bladder neck surgery, and severe attenuation of endopelvic fascia. Treating stress urinary incontinence secondary to severe intrinsic sphincter deficiency is often more difficult than treating urethral hypermobility. This is why severe intrinsic sphincter deficiency is often referred to as complex, or complicated, stress urinary incontinence. If the urethra displays low outlet resistance, treatment must be designed to increase outflow resistance. 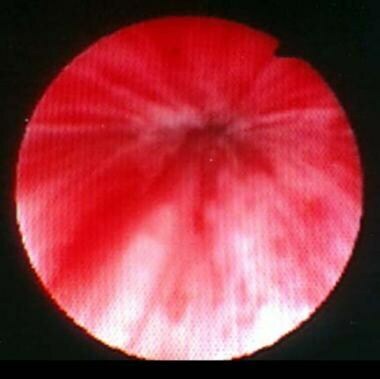 Periurethral bulking agents should not be used in the setting of pure urge incontinence or bladder outlet obstruction. A patient with mixed incontinence (ie, stress and urge urinary incontinence) in whom the urge component predominates should ideally address the overactive bladder prior to treating the stress incontinence component. However, at times, treating the stress incontinence can improve urge incontinence symptoms. Patients with a hypersensitivity to collagen, noted on skin testing before injection, should not undergo this type of therapy. Otherwise, patients should not receive injectable therapy if a concern exists for urinary tract infection or for bacterial colonization of the urinary tract, owing to the risk of abscess formation and potential for sepsis. Injection may be performed with the patient under local anesthesia in the office or in the operating room. After careful preparation and draping in a sterile fashion, induce local anesthesia by gently instilling 2% lidocaine jelly directly into the urethra. If additional anesthesia is needed, 1% lidocaine may be injected into the periurethral tissues next to the urethral opening. All patients should receive prophylactic antibiotics prior to injection according to recent American Urological Association guidelines on cystoscopic procedures. The setup needed varies depending on whether transurethral or periurethral injections are being performed. The use of transurethral injections requires a standard cystoscopy setup. A rigid scope designed for injections must be used. The development of flexible scopes with injection capabilities is ongoing. If periurethral injections are being performed, a cystoscopy setup may still be helpful in order to image the urethra to assess for coaptation and possible urethral spillage of the injected agent. Place the patient in the lithotomy position. Prepare and drape the vaginal area in a sterile fashion. The operating table should be a comfortable height with the patient secure and thus unlikely to fall. Injectable bulking therapy is performed predominantly in an outpatient setting. A preoperative urine culture should be obtained to check for infection. If using bovine collagen, a skin test should be completed on patients 30 days before surgery rule out an allergic reaction. Patients are typically given a prophylactic antibiotic prior to the procedure, owing to the risk of urinary tract infection as a result of instrumentation and manipulation. Bovine collagen received US Food and Drug Administration (FDA) approval in 1993 for treating women with intrinsic sphincter deficiency. Collagen is a natural protein commonly found in animal bones and connective tissue. The collagen used to treat female urinary incontinence is extracted from cattle, purified, and prepared for use as a bioinjectable agent via cross-linking with glutaraldehyde. When collagen is injected around the urethra, the resultant bulking of periurethral tissue closes off the urethral lumen, which maintains urinary continence. Calcium hydroxylapatite was approved in 2005 for periurethral injection. The particles are combined with sodium carboxymethylcellulose as a carrier. Studies suggest after dissipation of the carrier that calcium hydroxylapatite particles remain and eventually result in tissue ingrowth and new collagen formation. As is the case with collagen, most patients who receive calcium hydroxylapatite require additional injections after the first year. Carbon bead particles may be more difficult to inject than collagen because of increased viscosity and the need for an 18- to 19-gauge needle. If any resistance to the injection is encountered (eg, scar tissue), then the suspension gel tends to flow first and leave the carbon bead particles behind. Otherwise, the development of abscesses or the erosion of carbon bead depots into the urethra has been noted. Polydimethylsiloxane is a permanent material that can be administered via periurethral injection. [15, 16] The FDA approved its use in 2006, and a randomized prospective study compared it with bovine collagen and found that it achieved excellent efficacy at 12 months. It also appears to be more durable than collagen with regard to length of effect. Concerns for migration were initially raised, but the majority of solid particles in the suspension are over 100 µm in size, making this less of a concern. This product is no longer clinically used owing to evidence of particle migration to organs such as the lymph nodes, lungs, and brain. Polytetrafluoroethylene is an inert plastic material that initiates a foreign body reaction and granuloma formation at the injection site. It stimulates an ingrowth of fibroblasts that help to hold particles within the periurethral tissues and facilitate inward compression of the urethral lumen. Dextranomer/hyaluronic copolymer has been used in Europe for the treatment of stress urinary incontinence in women. In the United States, it has been used extensively in children with vesicoureteral reflux. It has since been withdrawn from the market over concerns of abscess formation. The advantages of injectable urethral bulking procedures include their simplicity, minimal risk of associated complications, and repeatability. These may be performed on an outpatient basis and can often be done quickly and relatively painlessly in the surgeon’s office. When an antegrade approach is chosen, the procedure must be performed in the operating room owing to the need for suprapubic access. After the injection, patients notice immediate results. The disadvantage of injectable urethral bulking procedures is that the therapeutic effect is generally not permanent. If stress urinary incontinence persists after the initial injection, the surgeon can implant more material during subsequent interventions. Long-term success is possible but multiple reinjections are typically necessary. After completing the preparation, as outlined previously, insert the cystoscope into the urethra. Meticulously perform the entire procedure under direct vision using the cystoscope. Inject the collagen either periurethrally (ie, placed next to the urethra) with a standard syringe and needle or transurethrally (ie, placed directly into the urethra) using the cystoscope with endoscopic injection setup. [21, 22] Although continence results are comparable with either approach, the transurethral route is generally preferred because more precise and efficient placement of collagen may result in a lower rate of treatment failure and higher patient satisfaction. One or more (2.5-mL) syringes of collagen may be required for each treatment. For periurethral injection, slowly insert a straight or bent needle next to the urethral opening and into the submucosal tissues. After ascertaining the proper position of the needle in the proximal half of the urethra, slowly inject at 3 sites around the urethra: the 2-, 6-, and 10-o’clock positions. As the injection progresses, the urethral lumen should be directly visualized to close. To ensure success, complete apposition of the urethral mucosa must be confirmed at the end of the procedure. For transurethral injection, use a cystoscope with endoscopic injection setup to infiltrate collagen beneath the urethral mucosa. Insert the cystoscope into the mid urethra. Under direct vision, carefully insert the tip of the needle beneath the urethral mucosa. Ensure the needle bevel is facing the center of the urethral lumen. Precisely deposit the collagen into the submucosal tissues until complete coaptation of the urethral mucosa is visualized. The antegrade route is reserved for men who are incontinent after prostatectomy. Create a suprapubic tract under adequate general anesthesia if possible, although epidural anesthesia may be performed in some cases. Insert a flexible cystoscope into the bladder via the suprapubic tract. Identify the bladder neck. Under cystoscopic vision, carefully insert the tip of the needle underneath the bladder neck mucosa. Precisely deposit the collagen into the submucosal tissues until complete coaptation of the bladder neck is noted. After completing the preparation, as outlined previously, insert the cystoscope into the urethra. Generally, antegrade injection is not performed. Skin testing is not required prior to hydroxyapatite injection. Meticulously perform the entire procedure under direct vision using the cystoscope in much the same fashion as collagen injection. One or more (1-mL) syringes of calcium hydroxyapatite may be required. After completing the preparation, as outlined previously, insert the cystoscope into the urethra. Generally, antegrade injection is not performed. Skin testing is not required prior to carbon bead injection. Meticulously perform the entire procedure under direct vision using the cystoscope in much the same fashion as collagen or hydroxyapatite injection. Of note, a special syringe and 18-gauge needle are required, owing to the physical properties of the injectable agent. One or more (1-mL) syringes of carbon beads may be required. After completing the preparation, as outlined previously, insert the cystoscope into the urethra. Generally, periurethral and antegrade injections are not performed. Skin testing is not required prior to polydimethylsiloxane injection. Meticulously perform the entire procedure under direct vision using the cystoscope in much the same fashion as collagen, hydroxyapatite, or carbon bead injection. Unlike other products, differing amounts of the material are usually placed in the same transurethral locations. Specifically, a maximum of 1.25 mL at the 10-o’clock position, 1.25 mL at the 2-o’clock position, and 2.5 mL at the 6-o’clock position are injected. As such, multiple 1.25-mL syringes of polydimethylsiloxane are usually required. The product is packaged with a unique deployment device and may be best administered by slow injections with a pause for a few seconds between the injection of boluses. Furthermore, an approximately 30-second pause should be conducted prior to withdrawing the needle from the tissue. This aids in limiting product loss from the implantation site. Additionally, use caution and avoid passing the cystoscope over the implantation site to reduce the risk of product displacement. As discussed previously, this procedure is rarely pursued in current practice owing to poor therapeutic durability and the risks associated with fat injection, such as fat embolism. Nonetheless, the injection is carried out in much the same fashion as the other urethral bulking agents. After completing the preparation, as outlined previously, insert the cystoscope into the urethra. Generally, antegrade injection is not performed. Skin testing is not required prior to autologous fat injection. For harvesting the fat, make a small surgical opening in the suprapubic area and insert the end of a large (7-10 mm diameter) suction probe. Connect this to a high-suction device, and, using a liposuction technique, carefully extract 20-30 mL of fatty tissue from the lower abdomen. Thereafter, meticulously transfer the harvested fatty tissue to several syringes for the urethral injection. Other methods involve washing the cells and suspending them in a saline solution. Meticulously perform the entire procedure under direct vision using the cystoscope in much the same fashion as collagen injection. Because fat is of low density, it does not require a high-pressure injection system. An 18-gauge needle is used for periurethral injections, and a standard cystoscopic injection setup is used for transurethral placement. Complete urethral closure may require injecting 1-2 tubes. After bovine collagen injection, patients notice immediate results. Perform a cough stress test immediately after the injection to assess for cure. If stress urinary incontinence persists, consider immediately reinjecting additional collagen. If the patient remains dry, encourage voiding before discharging home. Prescribe oral antibiotics for 3 days. This procedure results in minimal urethral pain that responds to simple analgesics. Do not place a urethral catheter routinely after bovine collagen injection because it may cause molding of the urethra and injectable agent around the catheter. If molding occurs, the urethral lumen will be unable to properly close. If patients experience difficulty in urination, they may need to self-catheterize with a small (ie, 12 French) catheter. Permanent urinary retention is rare. If repeat injection is necessary for delayed stress incontinence, generally consider rescheduling it for 4-6 weeks later. After calcium hydroxylapatite, polydimethylsiloxane, or carbon bead injection, the postoperative care is identical to that after collagen injection. If an antegrade injection has been performed, urethral catheter placement is unnecessary. This is for concern of urethral molding, as noted previously. A total of 67-96% of women with intrinsic sphincter deficiency remain dry 1 year after injection. After 2 years, 40-49% of incontinent women were cured and 67-83% were either cured or improved. Reports indicate that collagen is a more effective bulking agent than fat. [23, 24] After 4 years, 27% remained cured and 36% remained improved. Antegrade injection of collagen has also been performed, with 70% of men incontinent after prostatectomy reporting cure or significant improvement. [31, 32] However, only a 10% cure rate and a 35% improvement rate were noted in another study. Although antegrade delivery of collagen appears promising, this therapy fails in a substantial number of patients at 2-year follow-up. In a multicenter, randomized, prospective trial comparing calcium hydroxylapatite with collagen injection, 63.4% of patients saw significantly improved continence at 1 year, with 38% of women requiring only 1 injection. The total amount injected during this trial was 4 mL and was significantly less than the 6.6 mL of collagen injected. It is unclear if calcium hydroxylapatite can benefit men with postprostatectomy incontinence. In 1999, the US Food and Drug Administration (FDA) approved carbon bead particle injections. The material underwent a randomized, multicenter, double-blinded study comparing it with collagen. Carbon bead particle injection yielded outcomes slightly better than those of collagen injection. However, to date, concerns about abscess formation, as well as erosion and leakage of the carbon particles, has raised questions regarding its clinical use. After fat injection, initial subjective improvement is reported to be as high as 83%, but the cure rate declines to 57% after 1 year. Patients generally require 1-4 injections (average, 2.5) to achieve continence. Again, because of the limited clinical efficacy compared with other methods and rare but serious complications such as fat emboli, autologous fat is rarely used in periurethral injection. Postprocedural pain medications are rarely required. It is good practice to call 24 hours after injection to inquire about urinary retention. If urinary retention does arise, advise the patient to initiate clean intermittent catheterization. Patient education from the nursing team on how to perform this has been an effective in accomplishing self-catheterization. Rarely, if the patient has a suprapubic tube in place, it may be clamped and unclamped using a timed voiding schedule. The suprapubic tube can then be removed once the patient demonstrates a normal voiding pattern. Subsequent follow-up occurs at 3 months, 6 months, and annually thereafter. Most women are able to void easily after injectable urethral bulking agent treatment. However, temporary urinary retention from urethral edema, urethral sphincter spasm, or overinjection of a bulking agent may occur. It is the most common complication of any injectable bulking procedure. The urinary retention is generally transient and self-limited. Patients can perform intermittent self-catheterization using a small catheter (ie, 12 French) for usually no longer than a few days to treat this complication. Complications are similar to those of collagen and carbon bead injections. Permanent urinary retention has not been reported. De novo urge incontinence may occur in 6% of patients. Complications are similar to those of calcium hydroxylapatite, collagen, and carbon bead injection. No serious long-term adverse events have been reported. Temporary urinary retention (24-48 h) is expected after autologous fat injection. This is the major postoperative problem and occurs in 7% of women. Patients can use self-catheterization with a small catheter (ie, 12-14 French) until it resolves. Permanent urinary retention has not been reported. Recurrent urinary incontinence may arise from poor tissue coaptation or resorption of the fat. Otherwise, lower abdominal pain at the site of liposuction occurs temporarily in 3% of patients. Fat embolization resulting in death has been reported. Kirchin V, Page T, Keegan PE, Atiemo K, Cody JD, McClinton S. Urethral injection therapy for urinary incontinence in women. Cochrane Database Syst Rev. 2012. 2:CD003881. [Medline]. Cornu JN, Peyrat L, Haab F. Update in management of male urinary incontinence: injectables, balloons, minimally invasive approaches. Curr Opin Urol. 2013 Nov. 23(6):536-9. [Medline]. Davis NF, Kheradmand F, Creagh T. Injectable biomaterials for the treatment of stress urinary incontinence: their potential and pitfalls as urethral bulking agents. Int Urogynecol J. 2013 Jun. 24(6):913-9. [Medline]. Leone Roberti Maggiore U, Bogani G, Meschia M, Sorice P, Braga A, Salvatore S, et al. Urethral bulking agents versus other surgical procedures for the treatment of female stress urinary incontinence: a systematic review and meta-analysis. Eur J Obstet Gynecol Reprod Biol. 2015 Jun. 189:48-54. [Medline]. Maeda Y, Laurberg S, Norton C. Perianal injectable bulking agents as treatment for faecal incontinence in adults. Cochrane Database Syst Rev. 2013 Feb 28. 2:CD007959. [Medline]. Mitterberger M, Marksteiner R, Margreiter E, Pinggera GM, Frauscher F, Ulmer H. Myoblast and fibroblast therapy for post-prostatectomy urinary incontinence: 1-year followup of 63 patients. J Urol. 2008 Jan. 179(1):226-31. [Medline]. Zaragoza MR. Expanded indications for the pubovaginal sling: treatment of type 2 or 3 stress incontinence. J Urol. 1996 Nov. 156(5):1620-2. [Medline]. Appell RA, Vasavada SP, Rackley RR. Percutaneous antegrade collagen injection therapy for urinary incontinence following radical prostatectomy. Urology. 1996 Nov. 48(5):769-72. [Medline]. Plotti F, Montera R, Terranova C, Luvero D, Marrocco F, Miranda A, et al. Long-term follow-up of bulking agents for stress urinary incontinence in older patients. Menopause. 2018 Jun. 25 (6):663-667. [Medline]. Culligan PJ, Koduri S, Heit MH, Rackley R, Thomson RB, Schwabe L. The safety of reusing injectable collagen: a multicenter microbiological study. Int Urogynecol J Pelvic Floor Dysfunct. 2002. 13(4):232-4; discussion 235. [Medline]. Culligan PJ, Rackley R, Koduri S, Thomson RB, Schwabe L, Sand PK. Is it safe to reuse a syringe of glutaraldehyde cross-linked collagen? A microbiological study. J Urol. 2000 Oct. 164(4):1275-6. [Medline]. Mayer RD, Dmochowski RR, Appell RA, Sand PK, Klimberg IW, Jacoby K. Multicenter prospective randomized 52-week trial of calcium hydroxylapatite versus bovine dermal collagen for treatment of stress urinary incontinence. Urology. 2007 May. 69(5):876-80. [Medline]. Lightner D, Calvosa C, Andersen R. A new injectable bulking agent for treatment of stress urinary incontinence: results of a multicenter, randomized, controlled, double- blind study of Durasphere. Urology. 2001 Jul. 58(1):12-5. [Medline]. Hidar S, Attyaoui F, de Leval J. [Periurethral injection of silicone microparticles in the treatment of sphincter deficiency urinary incontinence]. Prog Urol. 2000 Apr. 10(2):219-23. [Medline]. Koelbl H, Saz V, Doerfler D. Transurethral injection of silicone microimplants for intrinsic urethral sphincter deficiency. Obstet Gynecol. 1998 Sep. 92(3):332-6. [Medline]. Ghoniem G, Corcos J, Comiter C, Bernhard P, Westney OL, Herschorn S. Cross-linked polydimethylsiloxane injection for female stress urinary incontinence: results of a multicenter, randomized, controlled, single-blind study. J Urol. 2009 Jan. 181(1):204-10. [Medline]. Su TH, Wang KG, Hsu CY. Periurethral fat injection in the treatment of recurrent genuine stress incontinence. J Urol. 1998 Feb. 159(2):411-4. [Medline]. Hurtado E, McCrery R, Appell R. The safety and efficacy of ethylene vinyl alcohol copolymer as an intra-urethral bulking agent in women with intrinsic urethral deficiency. Int Urogynecol J Pelvic Floor Dysfunct. 2007 Aug. 18(8):869-73. [Medline]. Chapple CR, Haab F, Cervigni M, Dannecker C, Fianu-Jonasson A, Sultan AH. An open, multicentre study of NASHA/Dx Gel (Zuidex) for the treatment of stress urinary incontinence. Eur Urol. 2005 Sep. 48(3):488-94. [Medline]. Faerber GJ, Belville WD, Ohl DA. Comparison of transurethral versus periurethral collagen injection in women with intrinsic sphincter deficiency. Tech Urol. 1998 Sep. 4(3):124-7. [Medline]. McGuire EJ, English SF. Periurethral collagen injection for male and female sphincteric incontinence: indications, techniques, and result. World J Urol. 1997. 15(5):306-9. [Medline]. Gorton E, Stanton S, Monga A. Periurethral collagen injection: a long-term follow-up study. BJU Int. 1999 Dec. 84(9):966-71. [Medline]. Winters JC, Chiverton A, Scarpero HM. Collagen injection therapy in elderly women: long-term results and patient satisfaction. Urology. 2000 Jun. 55(6):856-61. [Medline]. Kieswetter H, Fischer M, Wober L. Endoscopic implantation of collagen (GAX) for the treatment of urinary incontinence. Br J Urol. 1992 Jan. 69(1):22-5. [Medline]. Corcos J, Fournier C. Periurethral collagen injection for the treatment of female stress urinary incontinence: 4-year follow-up results. Urology. 1999 Nov. 54(5):815-8. [Medline]. Elsergany R, Elgamasy AN, Ghoniem GM. Transurethral collagen injection for female stress incontinence. Int Urogynecol J Pelvic Floor Dysfunct. 1998. 9(1):13-8. [Medline]. Smith DN, Appell RA, Rackley RR. Collagen injection therapy for post-prostatectomy incontinence. J Urol. 1998 Aug. 160(2):364-7. [Medline]. Smith DN, Appell RA, Winters JC. Collagen injection therapy for female intrinsic sphincteric deficiency. J Urol. 1997 Apr. 157(4):1275-8. [Medline]. Tiguert R, Gheiler EL, Gudziak MR. Collagen injection in the management of post-radical prostatectomy intrinsic sphincteric deficiency. Neurourol Urodyn. 1999. 18(6):653-8. [Medline]. Wainstein MA, Klutke CG. Antegrade techniques of collagen injection for post-prostatectomy stress urinary incontinence: the Washington University experience. World J Urol. 1997. 15(5):310-5. [Medline]. Wainstein MA, Klutke CG. Periurethral pseudocyst following cystoscopic collagen injection. Urology. 1998 May. 51(5):835-6. [Medline]. Klutke JJ, Subir C, Andriole G. Long-term results after antegrade collagen injection for stress urinary incontinence following radical retropubic prostatectomy. Urology. 1999 May. 53(5):974-7. [Medline]. Dmochowski RR, Appell RA. Injectable agents in the treatment of stress urinary incontinence in women: where are we now?. Urology. 2000 Dec 4. 56(6 Suppl 1):32-40. [Medline]. McLennan MT, Bent AE. Suburethral abscess: a complication of periurethral collagen injection therapy. Obstet Gynecol. 1998 Oct. 92(4 Pt 2):650-2. [Medline]. Stothers L, Goldenberg SL, Leone EF. Complications of periurethral collagen injection for stress urinary incontinence. J Urol. 1998 Mar. 159(3):806-7. [Medline]. The authors and editors of Medscape Reference gratefully acknowledge the contributions of previous authors Jong M Choe, MD, FACS, and Michael S Ingber, MD, to the development and writing of the source article.